Basanta Utsav is celebrated with immense fervor and zeal. On the day of Dol purnima (Full moon day of Falgun) Basanta Utsav is celebrated. 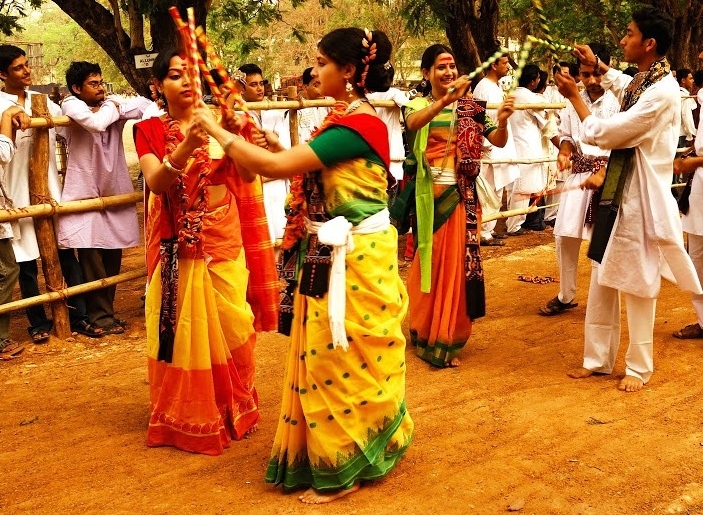 There is a procession of long musical dance in the morning followed by Tagore’s music, rhymes and dance by students of different Bhavanas (Departments). On that day Boys and girls, dressed in yellow (basanti) color, welcome spring – the season of hope, in a very elegant manner. Later in the day, on Basanta Utsav, the students as well as the teachers apply colored powders on each other. This powder is popularly called abeer (abhor). Following the coloring tradition, the entire premises of the university gets filled with the colors of abeer. A warm welcome is given to all the visitors and each of them is welcomed to join in this merry making festival. The air is filled not only with a number of vivacious colors, but also with the feeling of joy and hope, making the entire atmosphere delightful. In the evening one of the selected Dance Drama of Tagore is presented to visitors by the students of Sangit Bhavana, Visvs-Bharati. Since its inception, Basanta Utsav has become a milestone of Bengali history and has also captured international interest that is proved by the presence of numerous foreign tourists during its celebration.